“We are seeing in cities around the world and transport systems around the world, the beginning of a revolution,” said World Resources President and CEO Andrew Steer in Washington today. 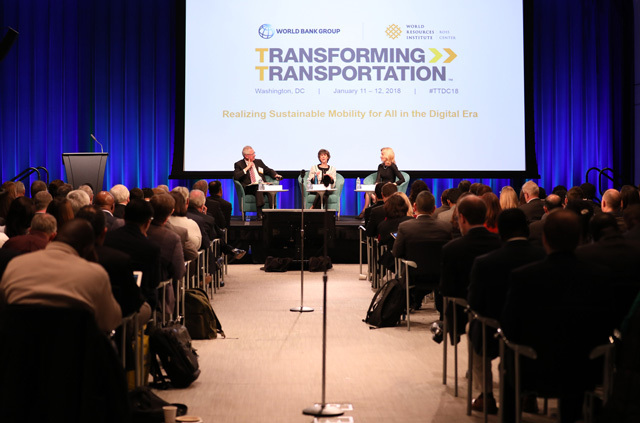 Welcoming more than 800 transport experts, policymakers, researchers and private sector representatives to Transforming Transportation, a two-day summit co-organized by WRI and the World Bank, Steer pointed out that the sector faces a paradox. There is incredible technological change occurring – driven by smartphones, networked sensors, data analytics, electric and autonomous vehicles, and other innovations. But despite these advances, and unlike in other development arenas like poverty and health, things are actually getting worse. There is more congestion, more pollution and more people dying on roads every year. Laura Tuck, senior vice president of sustainable development at the World Bank, who joined Steer during the brief but provocative opening session, agreed that the transport systems we have today are not the ones we need. But she pointed to movement in the right direction. “We have managed to position transport at the core of sustainable development goals through SuM4All,” Tuck said, referencing the World Bank-led Sustainable Mobility for All initiative. The program launched its first report this year, a worldwide assessment that includes “mobility snapshots” of 190 countries. “We know where we need to go,” she said. The sense that transport, or mobility more generally, faces an inflection point of some kind was present throughout the day. “Zipcar changed the way people use cars, Uber changed the way people used taxis, [and] Mobike is trying to change the way people use bikes,” said Davis Wang, the CEO of Mobike, one of the world’s largest dockless bike-sharing companies. Mobike and its competitors provide bikes for rent that don’t need to be returned to a central depot and can be parked and unlocked almost anywhere via smartphone. Almost 30 million people ride its orange-hewed bikes daily. In Beijing, Wang said 4 million people rely on the service everyday – twice as many as who use taxis. D.S. Mishra, who at India’s Ministry of Housing and Urban Development leads the development of metro rail and other transport projects in more than a dozen cities, said leaders need to begin understanding specific solutions not just as a mobility systems but as “urban transformation systems.” Sustainable mobility, ultimately, is universally accessible, affordable, safe and convenient, Mishra said. Achieving these goals is a major challenge that entails change far beyond the realms of engineering and design. Inequity – and the role transport can play in either exacerbating or alleviating it – came up again and again. “We’re leaving behind a lot of people because we aren’t able to map them, to see them,” said Nicolas Estupiñan of the Development Bank of Latin America. The data revolution that has helped make services like Mobike and Uber possible has produced tremendous amounts of information – but that doesn’t mean we know everything. People working informal jobs and relying on informal modes of transport, like walking or riding minibuses, leave little digital trace. Just 50 percent of people in Latin America use the internet on a regular basis, Estupiñan pointed out. In Nairobi, minibuses are the primary form of shared mobility and yet, until recent efforts, “we had no idea where they were going,” said Jackie Klopp of Columbia University’s Earth Institute. “The power of data is accountability for decision-makers,” said Estupiñan. But until we improve the prominence of some modes of transport and the people who use them, we won’t achieve that potential. In this way, access is about visibility – and a major political issue. “We are just now figuring out how to harness data for good instead of holding it back to the detriment of cities,” said David Adelman, vice president for business development at Via, a for-profit ride-sharing service and operator. A major difference between Via and its competitors, he said, was that they license their services and data to other operators, like public transit agencies. “We need to think big and embrace new technology, as opposed to being afraid of it,” he urged.